The best part is the cancel stamp on the back. It’s so rare to get mail from real people that this was a great surprise! Oh the postcard is for you. I was going to comment that the awesome person was you. That’s so great that you got mail like that. And now we know what Chris looks like! 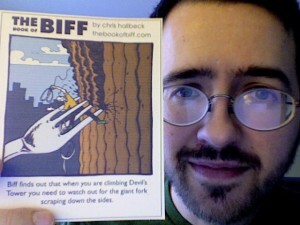 The computer screen reflected in your glasses is not Biff’s website! I’m ASHAMED of you. (Yes, I’m so obsessed I notice little details like that). I’m traumatized now I’ve seen your picture. My wallet has had a panic attack and gone all closed and cold. I laughed at that comic. 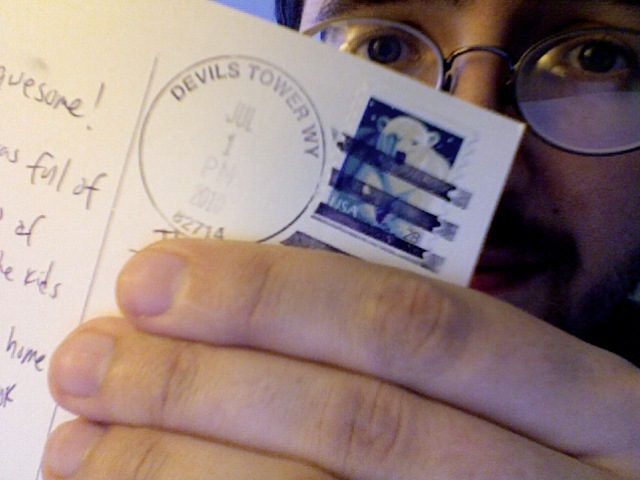 I’m laughing even harder knowing that you got a postcard from Devil’s Tower. I hope no one got hurt! @Mad David – today is a strange day. i reach the 1000th comic, i find out there are videos of chris working on comics, and i find out what he looks like. i’ve never been to devils tower. hell, i’ve never been ABROAD. pity me. pity me. pity me. Never been to Devil’s Tower. I HAVE been to Devil’s Falls/Devil’s Slide in Utah…..
Go Utah! The state, not the University. I looked at your glasses’ reflection (closer this time) and realized what it was. You still have a normal desktop?